I wish I had now, but I had no idea this would happen... Thank you for the information. I've got a question about backlight bleed. 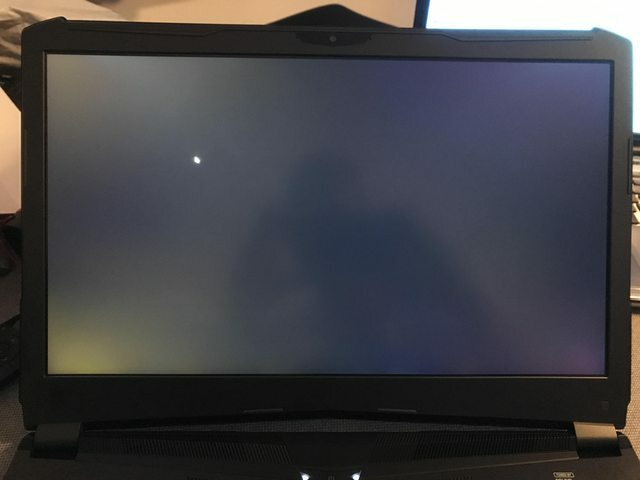 Would one consider the amount of backlight bleed in the picture below normal for an IPS panel in a Clevo? you need the latest system bios and EC just incase your on a very early build, then it should support maxwell cards (900M series). Then it's really a matter of vbios for best performance, although it should be hard to come by a vbios for the 980M that is not recognised at the least by the system , even if it does not auto-install as you might expect with a officially supported videocard. (this is considered an after market upgrade, just so you know). now once you know the hardware ID of the card in particular, you can follow through some of the tutorials or "How-To's" to modify the INF files in the NVidia driver package to get the card installed. You just want to make sure you see an option in the INF written "Optimus=1" under the right sections that your enabling the card, so that some difficult games, actually use the NVidia processor instead of the HD INTEL which they do sometimes, when the optimus option is not enabled because not being supported it takes control by default in switcheable mode.. etc..
Anyways, I can always help, or you can find help on these forums aplenty really. If you did in fact buy the card from a EUROCOM vendor, you can always try a support ticket as they mentioned. Yes and No, this looks more or less like there is slight tension in the bottom area of the panel where it is held on. Sometimes a trick might be to take the panel out, and loosen the screws holding the brackets that allow it to be held into the panel cover, the two brackets that line either side and have a few screws that bolt right into the panel itself on the sides. Then when they are semi loose, see if they can align better or leave them semi loose, put the panel back, try with just a screw here and there for perfect fit and to hold it in place and see if that makes a difference. try and play with the pressure on the corners and when it seems fit right get it set up that way. The margin for movement here is very tiny. If this is not a fix, then this is simply just the panel itself, but it should actually be very uniform, much more then shown, although - not 100% perfectly uniform, if you know which panel it is for example, we can always google it and look it up, and see what to expect, but this picture shows enough bleed that it looks like it's possibly being bent in the corner or have some pressure, hard to say. You can of course simply try warping the panel slightly manually without opening anything up, you know, bend and twist the panel ever so slightly, like do not damage it, this is just to see if it goes away or to see how warping or bending manipulates the bleeding, to give you an idea if this is normal for this panel or if it is simply a pressure thing. If it can be bent like a few mm and the bleed goes away then try the method I listed or some derivitive of fixing any bend. Sometimes it's simply the hinges are tighter on one side then the other, like imagine the left hinge in the picture is pushing forward while the right hinge is neutral with no pressure. Thanks woodzstack. Luckily it is not my laptop, I was unpleasently surprised to see a picture of this amount of backlight bleed though. My laptop has arrived and in daylight I'm glad I haven't seen any backlight bleed yet, hopefully it wil be the same tonight when it's dark, that would make me one happy camper. a) Are there any accredited repairers in New Zealand? I know Australia has a few, but shipping to Australia is just as inconvenient as shipping to New Zealand! b) Is there a source for parts, in the event something such as the motherboard fails? I have started planning for my long delayed update. My choices are either to go back to desktop and build my own or purchase a Clevo - as basically I'm after a ridiculous desktop in a laptop form factor . However the lack of NZ Based resellers for Clevo mean I'm exposed to taxes on import (which is fine) and lack of local warranty support (which is a bit scarier). We have lots of New Zealand customers with our EVOC High Performance Systems branded Clevo laptops. Many of them have purchased the HIDevolution Global Warranty, and they all get lifetime Technical Support from us. Shoot me an email at Donald@HIDevolution.com and I will reply with details. Vasudev and camberman3000 like this. I just got a Clevo P870TM with 8700K and single GTX 1080... Can I use a single 330W power supply with it or must I use the link box and two 230W power supplies? Why was there a scary note saying to use both and never just one? Are they assuming I only have those two 230Ws and that 230W isn't enough? That's fine but I'm wondering if it's something else. The way I understand it is if you have 1 video card you use 1 330w brick and 2 bricks with 2 cards.